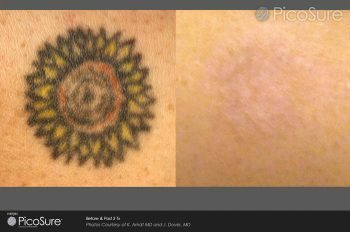 If you are looking for the answer to tattoo laser removal cost you have probably joined the ranks of people unsatisfied with their tattoo. Whether or not you never liked how it was executed in the first place or you have just grown to dislike it, you are not alone. With more and more people coming to regret their tattoos the technology for removing it has got better and better. Laser treatment has long been the most effective method but that has just got even better with the new PicoSure machine. The PicoSure machine requires much less treatments and can actually remove your tattoo in as little as 3-5 treatments! Which is really going to make a big difference to your pocket. Here at Pulse Light Clinic we use the PicoSure machine so that we can give you the best technology available. Here are the prices for a package of 4 treatments. It works out a lot cheaper to always buy the package rather than individual treatments. One treatments is not going to remove your tattoo anyway so if you are going to do it you should just jump right in. This package of 4 is particularly good as compared to the price of a single treatment you are actually getting your 4th treatment completely free! If you find that the tattoo is not 100% gone at the end of this course of treatments you can always buy another single treatment. An important thing to remember before you make any firm decisions on cost and the number of treatments is that Pulse Light Clinic offers a free consultation. In that consultation you will meet with a professional and they can really answer any questions that you have, confirm which size tattoo you have and based on the colour, location and age of the tattoo give you a more accurate estimate for the number of treatments you need.